After graduating from high school in the United States, Piero travelled to the West Indies to work on charter yachts for a year before returning to London, where he eventually studied Sound Design and Technical Theatre. This was followed by a spell in the music industry and backstage in theatres before spending three further years at drama school. Just as his career as an actor was about to start, he was diagnosed with Multiple Sclerosis, and years of drifting, lack of direction and indolence were focused in an abrupt epiphany thanks not to the diagnosis, but the manner in which it was delivered. Realising that a fundamental change occurs within even the most resourceful of people when they step into a highly charged situation, Island 41 was founded with the purpose of using actors’ techniques in everyday settings. He began building his portfolio and defining his inimitable style over the following years, and now conceives, designs and delivers his work in the United Kingdom and Continental Europe, Canada and Brazil, North Africa and the Far East. 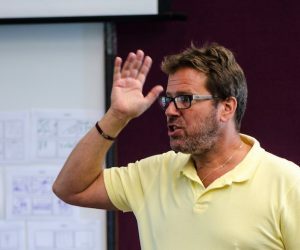 He has NCDT certificates in theatrical stage management and acting, is an accredited practitioner for MBTI, Belbin, SDI, C-Me and NLP, and has successfully completed an internationally recognised course in Transactional Analysis. In 2009 he began drafting short essays as a method of refining his thoughts, and this sparked a new career, alongside his existing work, as a writer. He published his first book in 2015, is gradually crafting a second and occasionally publishes articles on a number of transferable skills and related topics. Piero believes that personal effectiveness is directly linked the ability and willingness to build, maintain and continually develop healthy and dynamic interpersonal relationships. He feels that communication should be clear, direct, simple and unambiguous, and is a dedicated champion of experiential learning. He invariably finds the vocabulary of his audience and his style is lively, engaging and memorable. He lives with his wife, son and daughter on a smallholding near the Malvern Hills in Herefordshire and in late 2018, after seven years of being a hapless amateur smallholder, decided to convert his three and a half acres of pastureland into woodland. "I really enjoyed being in your company; it is like being in wonderful tropical rain."